Edward Solly [1776-1844], Berlin; purchased 1821 for the Königliche Museen (painting collection installed 1904 in the Kaiser-Friedrich-Museum), Berlin; sold 1924 to (Charles Albert de Burlet, Berlin). (Professor Luigi Grassi [1858-1937], Florence and Rome). (Arthur J. Sulley & Co., London). acquired 1927 by Otto H. Kahn [1867-1934], New York. (Duveen Brothers, Inc., London and New York); purchased 26 April 1937 by The A.W. Mellon Educational and Charitable Trust, Pittsburgh; gift 1937 to NGA. Ellis K. Waterhouse, "Review of Fern Rusk Shapley, Catalogue of the Italian Paintings, 2 vols., Washington, D.C., 1979," The Burlington Magazine 122 (September 1980): 637, states that the painting is "widely believed to have been painted almost entirely by Luigi Grassi." However, conservation examination and treatment by the NGA that was concluded in 1995 indicates that the original paint layer is well preserved. Mellon Trust purchase date is according to Mellon collection files in NGA curatorial records and David Finley's notebook (donated to the National Gallery of Art in 1977, now in the Gallery Archives). Duveen Brothers. Duveen Pictures in Public Collections of America. New York, 1941: no. 82, repro., as by Giovanni Bellini. Preliminary Catalogue of Paintings and Sculpture. National Gallery of Art, Washington, 1941: 19, no. 28, as by Giovanni Bellini. Book of Illustrations. National Gallery of Art, Washington, 1942: 239, repro. 67, as by Giovanni Bellini. Paintings and Sculpture from the Mellon Collection. National Gallery of Art, Washington, 1949 (reprinted 1953 and 1958): 34, repro. Walker, John. National Gallery of Art, Washington, D.C. New York, 1963 (reprinted 1964 in French, German, and Spanish): 302, repro., as by Giovanni Bellini. Summary Catalogue of European Paintings and Sculpture. National Gallery of Art, Washington, 1965: 23. European Paintings and Sculpture, Illustrations. National Gallery of Art, Washington, 1968: 16, repro. European Paintings: An Illustrated Summary Catalogue. National Gallery of Art, Washington, 1975: 54, repro. Shapley, Fern Rusk. Catalogue of the Italian Paintings. 2 vols. Washington, 1979: I:118-119, II:pl. 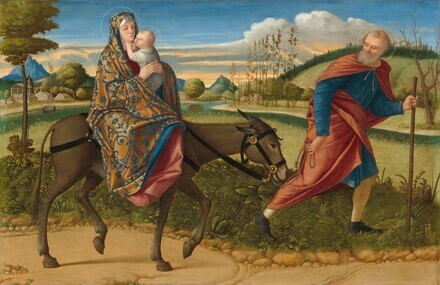 81, as Attributed to Carpaccio. Walker, John. National Gallery of Art, Washington. Rev. ed. New York, 1984: 203, no. 240, color repro. European Paintings: An Illustrated Catalogue. National Gallery of Art, Washington, 1985: 75, repro. Boskovits, Miklós, and David Alan Brown, et al. Italian Paintings of the Fifteenth Century. The Systematic Catalogue of the National Gallery of Art. Washington, D.C., 2003: 197-200, color repro. Martin, Kathleen. “Donkey,” in The Book of Symbols. Cologne, 2010: 361, fig. 1.